If you had of asked me two thirds of the way through The Cabin in the Woods (2012) what I thought of it, you would have gotten a positive answer. It was a good, not quite great and very clever experience. However then the film went and produced one of the most inspired and downright brilliant closing acts that I can recall. The Cabin in the Woods is a very rare beast indeed in that it functions expertly as an example of both meta-horror and straight horror. Rare is the film that can subvert a genre in this way, whilst also being a fantastic example of the genre at the very same time. It looked like the film had revealed too much too soon. The meta-nature of the entire concept is revealed quite early on. The film is best seen without having too much spoiled. I will do my best to avoid any huge spoilers, but I make no promises. The setup is standard slasher fare. Five college students, each representing an obvious stereotype (stoner, jock etc), head to a creepy isolated cabin in the woods for a weekend of booze, weed and getting it on. Vicious murders ensue. However, basically from the get-go, we know this is not a standard slasher film. 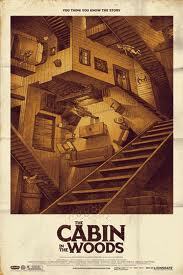 The cabin is set in some strange, The Simpsons Movie esque dome and is under constant surveillance by boffins. What initially appears to be a ‘big brother is watching you’ kind of thing soon evolves into something more nuanced than that. These boffins (two of them played brilliantly by Richard Jenkins and Bradley Whitford), also manipulate the situation, making the murders happen. It is kept delightfully obscure what master these folks are serving though, with hints smattered through the film. I first had the government pegged, then some sick and twisted billionaire who watched these murders for kicks. I’m not saying either of these assumptions is necessarily wrong, but it just shows that the film can take you down interesting thought paths. That summary gives you the first two thirds of the film, that I thought was really quite good. But I do not think I can sum up the brilliant final third without giving too much away. You simply just need to go and see the film, you really do. The closing act is a cacophony of incredible storytelling, effects and creature design. I know this is all a bit vague and I wish that I could go in to more details of what I thought, but it is impossible to do so without spoilers. The cast throughout the film are basically all really good. 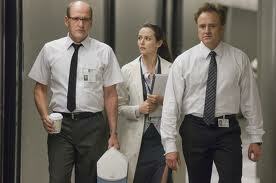 I love Richard Jenkins, he is one of my favourites, so it was so great seeing him in this. The five actors who make up the college party – Kristen Connelly, Chris Hemsworth, Anna Hutchison, Fran Kranz and Holden Williams – are all really good too. Chris Hemsworth is good here and continues to grow on me as an actor. I think he has a decent amount of talent to go with his physical presence. I sat down and watched the pretty dire Snow White and the Huntsman (2012) this morning and he was by far and away the best thing in it. Kristen Connelly, an unknown to me, plays the lead character and she is likewise very good, both playing up her slasher film stereotype and creating a multi dimensioned person behind that. The Cabin in the Woods makes exceedingly interesting use of horror tropes, examining a genre in an exhilarating and enjoyable way. Too often genre examinations in films come out borderline academic and too self knowing. No such issues here. The connection of the contemporary horror film with mythological undertones is made; and shows the mark of a couple of really creative creators at work behind this film. Watch it. I can’t promise you will like it, but you will find an original film here. Fantastic film and a great review. It definitely shows that there IS still some hope for a good Hollywood horror flick. Maybe we outta let Whedon write every film? I really feel Im alone in my dislike for this movie……..your write up makes it sound so good though!! I need to watch it again, I fear I missed something on my one and only watch. Well I’m definitely glad that I got my love for this film across. Maybe it just didn’t work for you. Like I said, I am not sure how someone who loves horror and watches a lot would necessarily feel about the film and how it subverts the genre. Thankyou sir. I’m sure Tyson is not alone. There must have been someone else out there who didn’t feel it. Great review man. This was one of my favourite films of last year, I thought it was brilliant. I just loved how many different monsters and creatures they had. If anything, I wanted to see more of them! After the ending, I came out of the cinema perplexed but after I thought about it, I liked it more and more. Yeah it is one of those films that you like more and more as you get further away from seeing it. Doing my year in a review, I’ve been thinking about that a lot. Some films just grow and grow, and you like them more (Bernie was the big one for me this year), whilst others you dislike as time passes (Prometheus fit that bill for me). I’m sure there is some reason why, but I haven’t solved it as yet.